It’s safe to say we’ve reached ~peak~ American Horror Story. The horror anthology series was just renewed for a seventh season (to that news, a resounding “Yasssss!”), and we have oodles of fun/bonkers/terrifying AHS fan theories to mull over for the current, exceedingly mysterious sixth season, AHS: Roanoke. Several of the theories we’ve recently explored have functioned to possibly explain how this season connects to past seasons, what the F is going on with this bizarre docu-series format, and whether there might be more to these characters than meets the eye. But there’s still one aspect of the season that we’re struggling to pin down – Lady Gaga’s mysterious woodsy, maybe-demon maybe-witch character. One convincing theory offers a possible explanation for what the strange creature played by the pop icon actually is. According to a recent post by Reddit user ash_dub69, Gaga’s character is actually a mythical figure – the Maenad. The evidence for this theory is surprisingly sound. Like, I’m just about convinced she HAS to be a Maenad – no other explanation (witch or demon or plain-old strange lady) fits *quite* as well as this one. Maenads (literally meaning “raving ones”) are “immortal female followers” of the god Dionysus, who was basically the patron saint of woodland-based debauchery and frenzies. Several thousand-year-old *spoiler alert*: In The Bacchae, women “possessed” by Dionysus are spun into such a frenzy that they literally tear a dude to shreds with their bare hands. "The hint Lady Gaga gave of her character was that she is 'very in the earth; very grounded.' Maenads are part of the earth, the air, of everything." Ah-ha! Interesting. 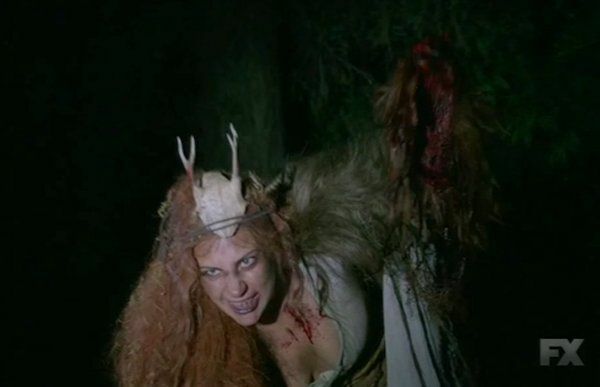 The theory goes even further, connecting Gaga’s possible-Maenad to another Maenad we’ve seen in a supernatural horror show – True Blood. Maryanne’s orgies = exactly like what went down between Matt and Gaga’s woodland villainess on “Chapter 3.” Hmmm… Wonder what Lettie Mae would think of this. And of course, as I’m sure we all recall (because it was straight up HORRIFYING), Gaga’s character fed The Butcher an animal heart to seal their deal — The Butcher’s soul in exchange for Gaga-creature’s help to exact revenge on the men who exiled and left the Butcher to die. This is easily one of my favorite (AND one of the most promising) theories so far. What do you think?